Porcelain tile shower in a complete bath remodel. This shower features a glass subway accent band. This mosaic band intersects a recessed niche with mitered edges. 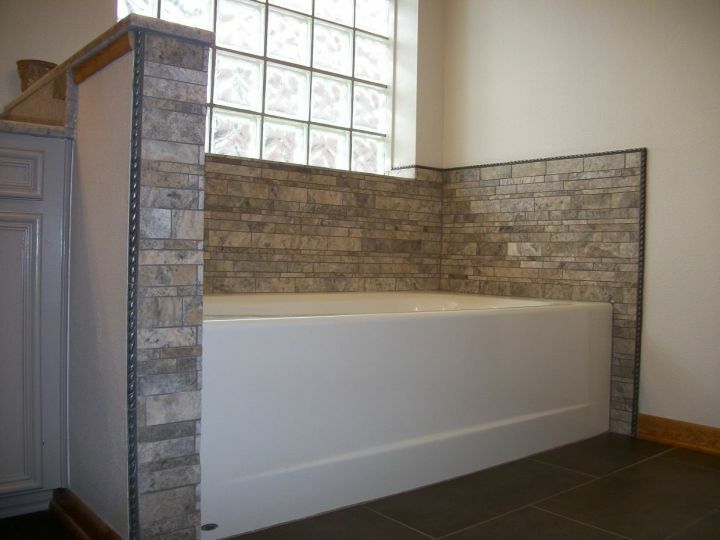 The tile bench seat sets beside a half wall with a mitered edge. On the floor are the same matte finished large tiles with a nickel drain set on a diamond. 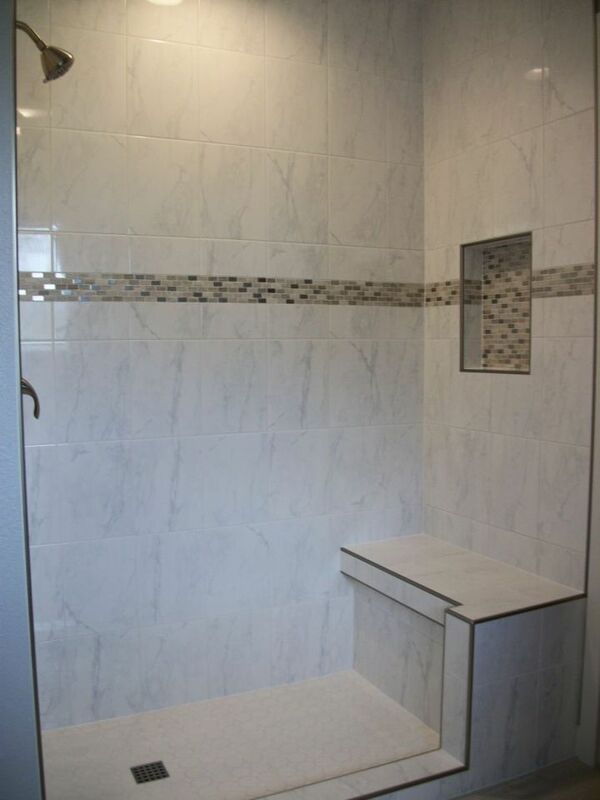 Porcelain tile shower with tile bench seat. One large tile diamond serves as a focal point in this shower. The diamond and band are made from the square mosaic tile of a darker color. Separating this feature from the regular wall tile is a dome pencil liner. In both corners of the shower are two corner shelves that blend right into the mosaic band. 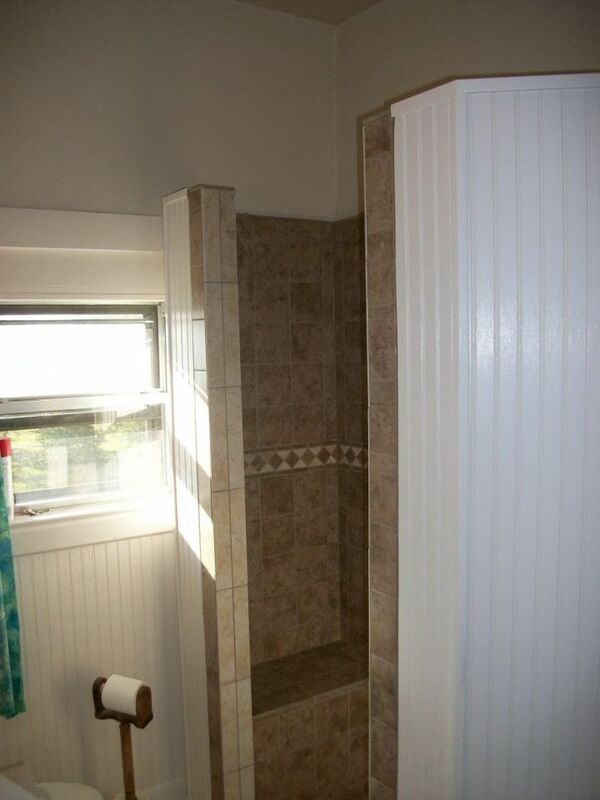 The tile seat has a clipped corner to keep all sharp corners out of the shower space. The base of the bench has a slope back to keep the shower floor more open. A nickel drain set on a diagonal in the mosaic shower floor compliments the large diamond tile on the wall. Linear honed marble tile on kitchen backsplash. Backsplash tiles are of varying width and random lengths. An accent band of linear glass tile adds a flare of color. 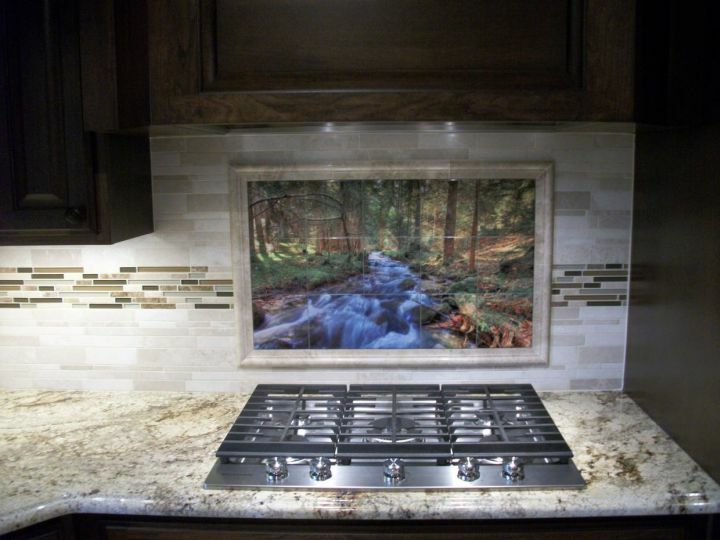 Over the kitchen cooktop is a border framed tile of a painted tile mural. White carrara look tile shower with nickel metal trim. White rectangular tile is divided by a gray and metal tile accent trim. The same mosaic tile fills the back side of the recessed niche. All edges of tile shower are bounded with a nickel metal edge profile. The shower bench seat has a small seat ledge and partial wall for glass enclosure to set on. 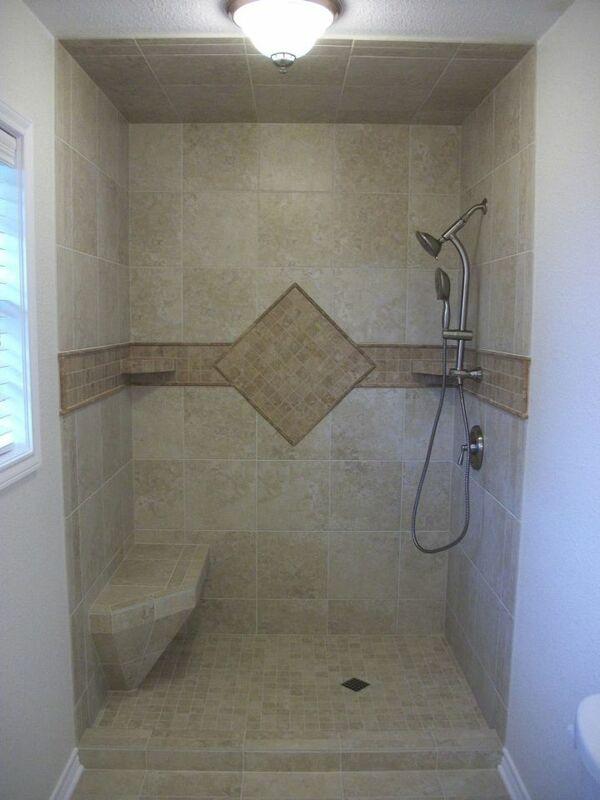 Noce ceramic tile shower with gold and random mosaic accent band. Wall tiles are small squares set on a half offset pattern. The mosaic has a subway tile that borders a random colored mosaic strip. 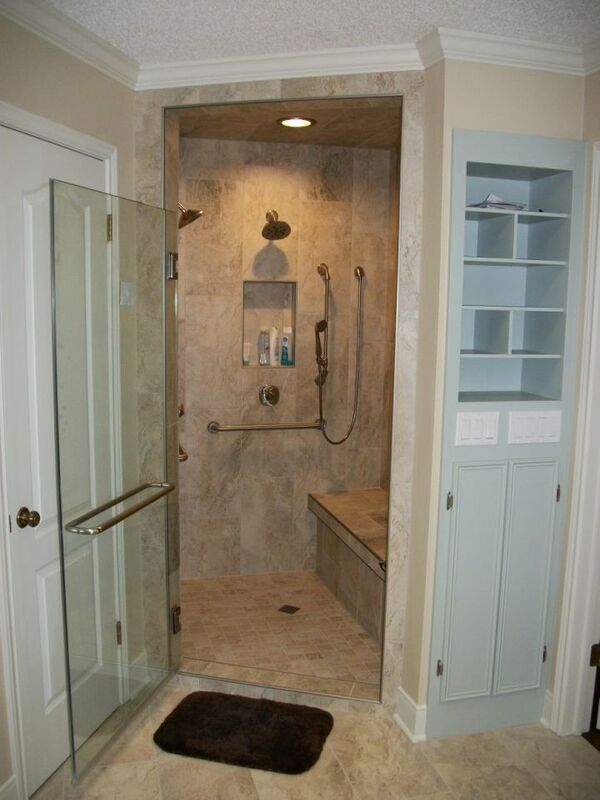 This shower features a Delta In2ition shower with hand wand and single handle valve. 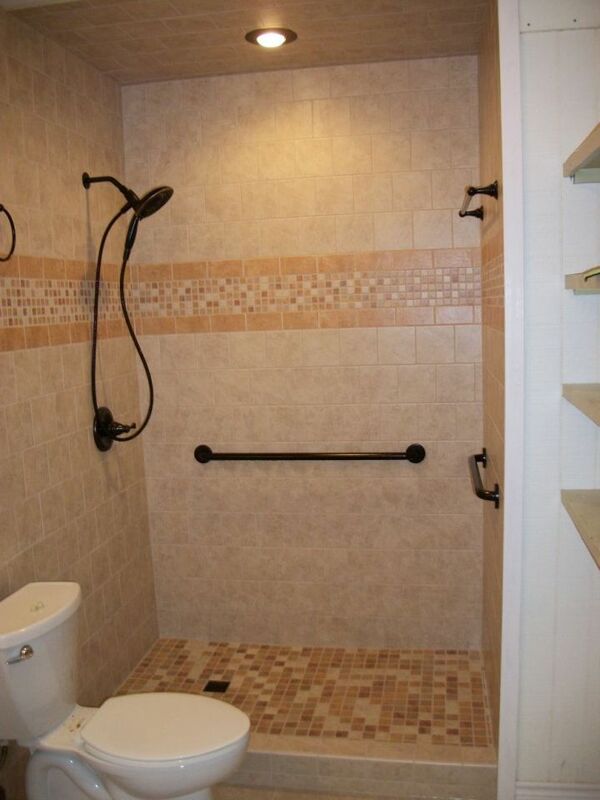 Trim is a bronze finish on the fixtures, grab bars and shower floor drain. There is also a towel bar located in the shower to place wash clothes on. Porcelain tile shower with rectangle tile. These rectangle tiles have been set in a random pattern vertically. Tile wraps thru the corners, over the ceiling, and onto the bench. Two recessed niches, set into the tile pattern and framed with nickel metal edging, are set over the shower valve and the diverter valve. Diverter valve allows selection between either of the two shower heads or the hand shower. 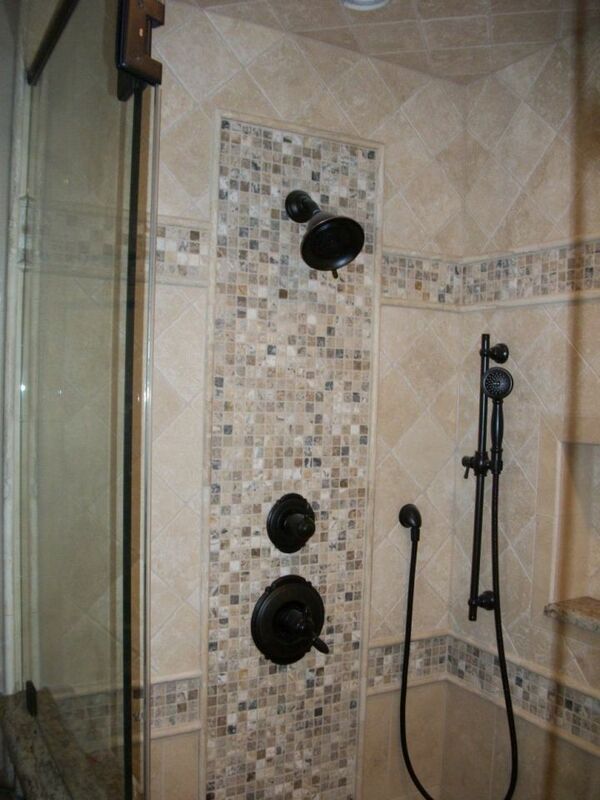 Tile tub shower surround with linear glass and marble tile border and oil rubbed bronze fixtures. Main tile is set in a traditional square pattern and band divides thru surround at eye level height. Linear marble mosaic used on tub surround. Tub surround edge is bordered with a rope pencil liner. Fixtures are bronze. 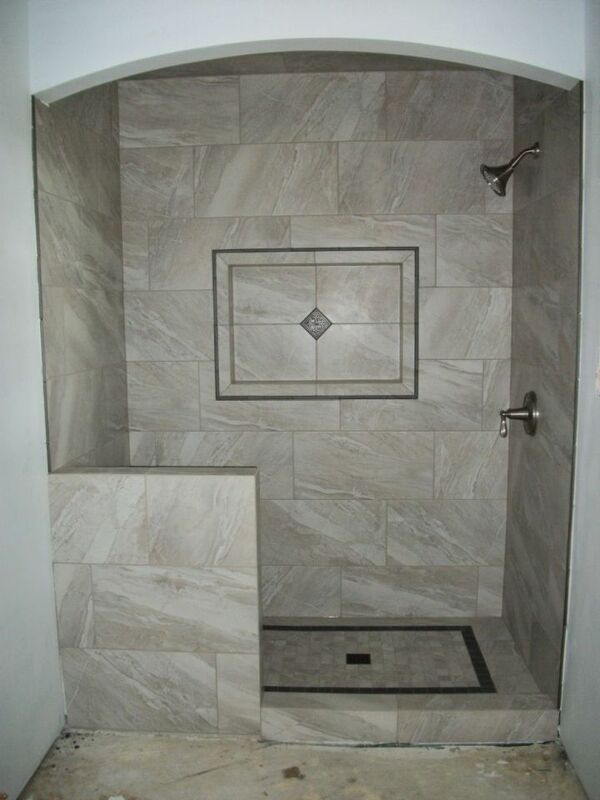 Travertine tile shower with multiple patterns. 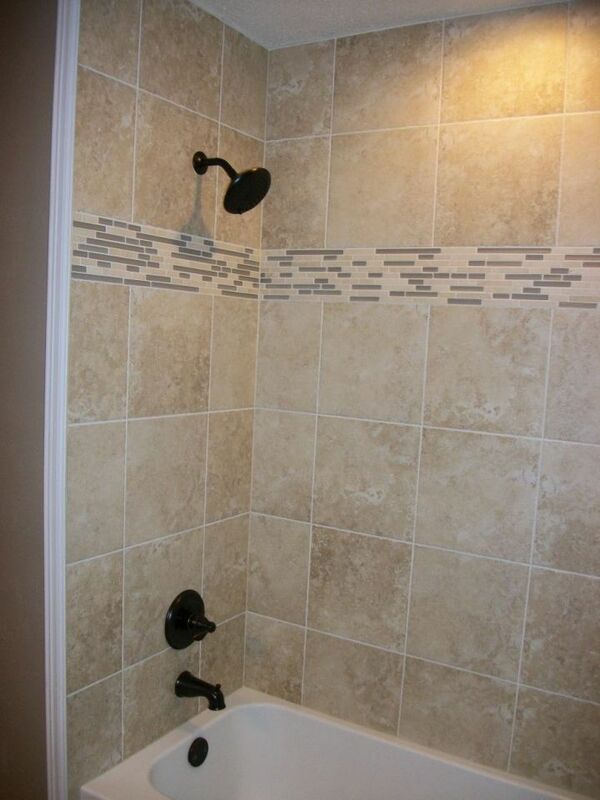 Shower floor is set on a diagonal and then transitions to a square tile on the lower portion of tile shower. Above this is one of the two mosaic band that traverse horizontally thru the shower. And now the pattern again switches back to a diamond pattern that is mirrored in the corner and also onto the ceiling. The tile shower is bordered with a band of tile that boundaries the frameless glass enclosure. There is also a onyx mosaic on the shower seat face and granite is used for the seat top. Granite has also been cut for the niche bottom and the top surface of the half walls. 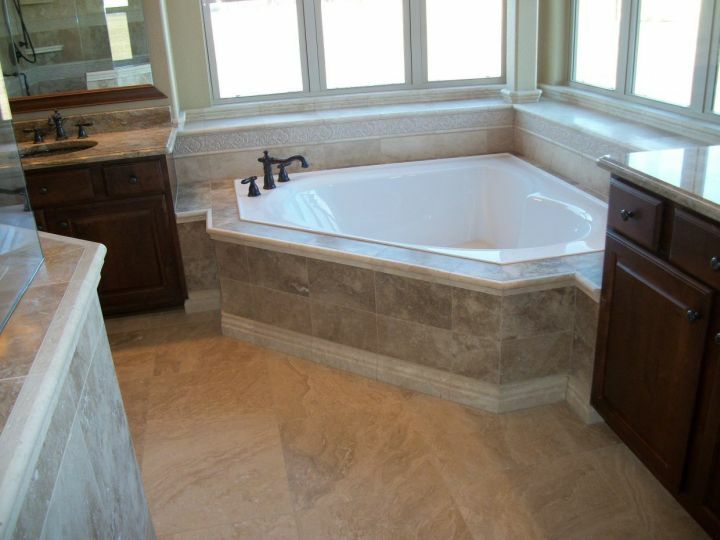 Noce travertine tile on corner garden tub deck and skirt. Front edge has a double ogee edge and a tile base moulding. Above the tub is a tiled window seat that has a listello band just below the seat. Capping the top edge is another ogee edge. This tile shower is nestled into a beadboard wall boundary in a farmhouse bathroom. This shower has two niches that are nestled back into the angled walls of the shower. The recessed niches are divided by a diamond pattern band that runs thru the entire shower space. It also has a shower bench and a diagonal pattern on the shower floor. 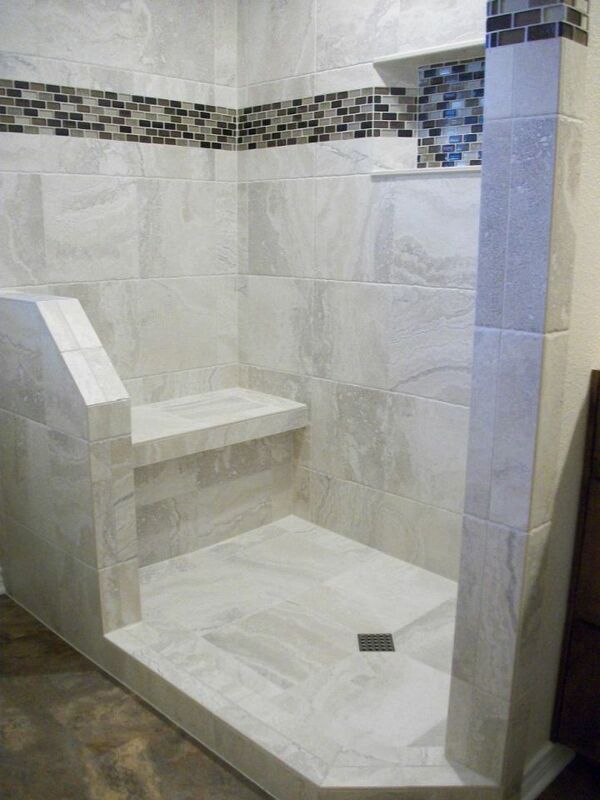 Large gray rectangle tile shower with arch top and half wall. The rectangle tile is set in a one third offset pattern that travels across the wall. The tile pattern wraps thru the corner. Behind the partial wall is a shower bench. This tile shower also features an inset niche that is bordered with a pencil rope liner and a diamond accent in the center of the recess. The accent diamond is complimented with the same diamond in the corners of the rug border for the floor mosaic.